Kenneth "Kenny" E. Hill, age 81, of Elwood, passed away on Saturday, January 26, 2019 at Community Parkview Health Living following an extended illness. Kenny was born on May 9, 1937, in Elwood, Indiana to the late Noah "Bud" and Blanche (Parker) Hill. Kenny graduated from Wendell L. Willkie High School in 1956. Kenny proudly served his country with the United States Air Force. He married his first wife Eleanor (Hemphill) on Oct. 18, 1963. They shared over 46 years of marriage together before she passed away on Feb. 11, 2010. On August 11, 2012 Kenny married his current wife Jacqueline (Barney) Hill. Kenny was hired on January 11, 1964 by the Elwood Fire Department where he served as a fireman for 20 years, retiring on January 27, 1984. Kenny was first promoted to Lieutenant in 1976. He also served as the Assistant Fire Chief in 1977, 1980 and 1981. Kenny cherished his time at the department with his fellow brothers, spending many hours playing euchre, socializing and serving his community. 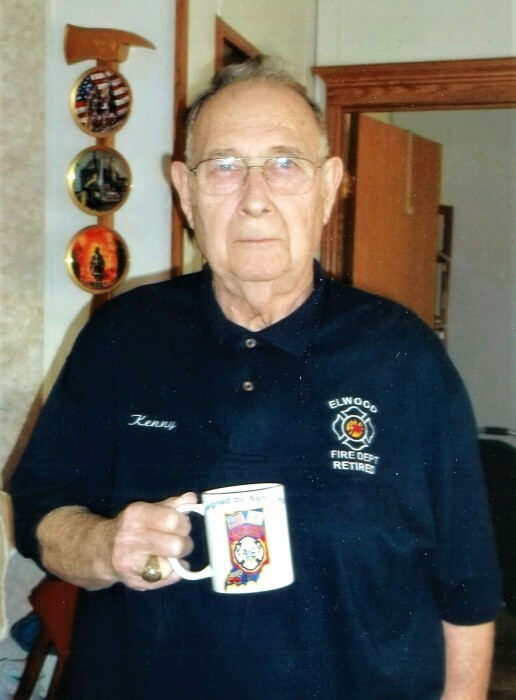 Kenny was instrumental in creating and designing the Elwood Fire Department's patch, which was implemented in 1971, and is still worn on the uniform today by every fireman. Kenny coached football along side Blackie Wilson at the Wendell L.Willkie Junior High School from 1960-1971. Kenny also worked for Steel Slitting for many years. Kenny enjoyed his time at his lake home on Kuhn Lake. Kenny will be fondly remembered for painting personalized rocks and giving them to his many friends throughout the community. Kenny also enjoyed returning to the fire department whenever possible, playing cards and reminiscing with his fellow fireman. Kenny was a loyal and faithful husband, brother and friend to many and will be greatly missed. Kenny is survived by his wife Jacqueline (Barney) Hill of Elwood, Indiana; three stepsons, Robert (Pam) Lucas of Indianapolis, Tom Lucas of FL, and David Lucas of Ft. Wayne, Indiana , special friend Duane Etchison and his extended family at the Elwood Fire Department. Kenneth was preceded in death by his father, Noah E. "Bud" Hill, mother, Blanche Hill, first wife, Eleanor Hill and his two brothers, Don Hill and Bill Hill. Funeral services celebrating Kenny's life will be conducted at 1:30 pm Friday, February 1, 2019 at Dunnichay Funeral Home, Elwood, Indiana with Pastor Jerry Winegarden officiating. Burial will follow in the Elwood Cemetery. Visitation for family and friends will be Thursday, January 31, 2019, from 4:00 pm - 8:00 pm, at Dunnichay Funeral Home, 1113 S. Anderson Street, Elwood, Indiana. In lieu of flowers memorial contributions may be made to the Elwood Fire Department through the funeral home.